I suppose my travel blog would never be complete without a photo of Ayer’s Rock or Uluru as it is now known. (It recently took back its Aboriginal name). I didn’t want to start this off with another typical photo of Ayres Rock, so thought a view from the top over looking Yulara would be a change. Uluru is situated in the centre of Australia within the Northern Territory. This is now a World Heritage Area for both its cultural and natural values. The National Park is named Uluru-Kata Tjuta, and is about 270 miles southwest of Alice Springs. Uluru is sacred to the Aboriginals, contrary to popular belief it has no actual meaning. It is actually named after an Aboriginal family from many years back. It was discovered in 1872 (well by a non-indigenous person) by Ernest Giles, he never actually got close to it as what stopped by the Lake Amadeus. But a year later William Gosse visited the rock and called it â€œAyres Rockâ€ after Sir Henry Ayers who was the Chief Secretary of South Australia. Uluru used to be known as a monolith rock and is 346 metres high, over 5 miles in diameter with a hard exterior which is unusual to other large rocks. Because of this it has prevented formation of scree slopes, http://en.wikipedia.org/wiki/Scree which has given it it’s unusual steep sides. It used to be thought and was listed as the world’s largest monolith. However this is misleading as Uluru is actually part of a massive underground rock formation which includes The Olgas. (This rock formation is often mistakenly thought to incorporate Mount Conner, which is actually a different rock formation altogether). But little to worry Australia still hosts the world’s largest monolithâ€¦ Mt Augustus! Which is in Western Australia and is around 2.5 times the size of Uluru and is about 850m high! Uluru looks amazing at sunrise as is famously known for appearing to change colour. It’s made from sandstone but is full of minerals like iron and feldspar. It’s the oxidisation of the iron that gives Uluru the rusty red colour. And the feldspar reflects the red light of the sun when rising or setting which appear to make it sort of glow. 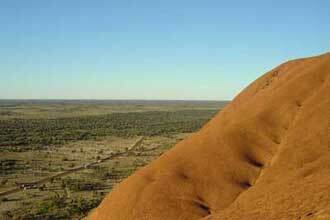 The Aboriginals do not climb Uluru due to its spiritual significance. They also do not like visitors climbing it either, this is mainly due to the fact that the route crosses a sacred traditional â€œdreaming trackâ€, secondly they feel a sense of responsibility for the visitors on their land to be safe. However climbing Ayres Rock is still very popular whether right or wrong. It was much harder than I had imagined to climb to the top and took me about 45 minutes at a fast pace. Believe me this is not for the faint hearted! There have been at least 40 recorded deaths from falls and heart attacks. So please be very careful if you decide to climb. For me personally the spectacular view from the top of Yulara was most worthy of the climb. Congrats on an interesting travel blog with top photos. 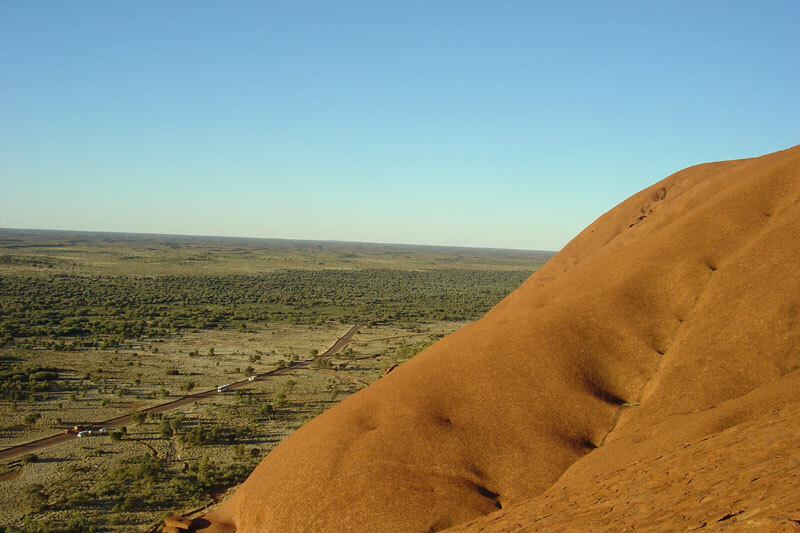 I agree with you about Ayers Rock – have climbed it two times, and the effort was worth it ! I respect the aboriginal viewpoint, but also feel that climbing the rock should be available for all. I took a tour to Ayers Rock with a group of people. Our guide was adamant that nobody should climb the rock, and actually took a disliking to a small number of the group that wanted to climb it. As it turned out, the weather was too windy and the slope was closed. It’s one of those awkward decisions where you don’t want to be disrespectful, but you also want to experience the place to the full. Nice pic, good to see the place with some greenery around.